AMES, Iowa — Iowa State University is part of a study to provide organic grain farmers more information about the best way to incorporate no-till agriculture into their production systems because they typically use tillage to manage weeds. Organic farmers are restricted in their weed management practices with the ban on synthetic herbicides. Instead, they use natural mulches and tillage, which is subject to erosion and run-off. The USDA-NRCS-Conservation Innovation Grant program awarded $1.1 million to the University of Wisconsin, the lead institution, the Rodale Institute and Iowa State. The participating institutions provided another $1.1 million of matching support. Iowa State’s contributions included state funds in support of faculty and staff scientists and also $10,000 provided by the Leopold Center for Sustainable Agriculture’s private endowment. Delate said in-kind matches for inputs, equipment and labor are coming from a farmer-cooperator, Levi Lyle of Keota; seed from Blue River Hybrids; and field day assistance from Practical Farmers of Iowa. The Rodale Institute of Pennsylvania developed organic no-till in 2004, but the system needs more research to refine it, she said. 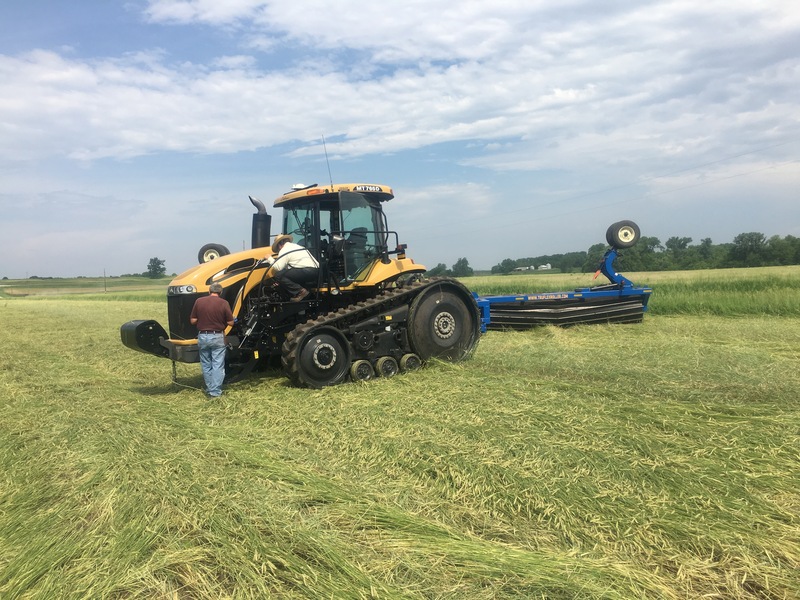 Researchers will explore and demonstrate which innovations in cover crop selection, planting dates, roller type, planter modifications and termination methods lead to the most successful organic no-till outcomes for soil health, corn and soybean yields and farm profitability. The research group will hold field days at farmer-cooperator sites in Iowa and Wisconsin throughout the four-year project, which will be promoted on the Leopold Center webpage. The center will participate in sharing the research results and integrating researcher and farmer knowledge and perceptions into guidelines for organic grain growers throughout the U.S.
Organic no-till farmer, Scott Shriver, uses a roller/crimper on rye cover crop prior to planting soybeans.